Editors’ Note: This is the fourth blog post in our series featuring reflections on and learnings from the 2016 ​Carnegie Foundation Summit on Improvement in Education. Each post provides recaps of sessions you may have missed and further insight into presentations you may want to revisit. Many of us are at a stage in our improvement journey where we are trying to convince others to join us in changing systems for the better. Some of us are working to get colleagues on board with our first improvement projects; others are lobbying organizational leaders to support the scaling of promising change ideas; many may be wondering how to make the case for an improvement science approach in a local context that may be resistant to working in a new way. All of us are undertaking efforts in which we must engage others to work with and support us—none of us can do this work alone. Crucial as it is to the long-term success of improvement efforts, generating support for (and engagement in) change can be incredibly difficult. Hahrie Han, professor of Environmental Politics at the University of California, Santa Barbara and the author of How Organizations Develop Activists, delivered a keynote address at the Carnegie Foundation Summit on Improvement in Education that offered some frameworks to help us grapple with questions that are central to many of our efforts to improve education. Why are the problems we face in education so intractable? We know that complex problems require complex solutions. Han delved deeper, focusing not on the solutions themselves but on the underlying theories of change that suggest those solutions and how different types of problems, as well as the contexts in which they reside, require different theories of change. Adapted from Hahrie Han, “Catalyzing Change,” Carnegie Foundation Summit on Improvement in Education, March 24, 2016. This idea is nothing new to practitioners of improvement science; it is reflected in the first core principle of improvement—make the work problem-specific and user-centered. This principle prompts us to involve all stakeholders—including those who will implement the change and those who might be affected by the change—in co-developing an understanding of the problem to be solved and the framework for improvement. 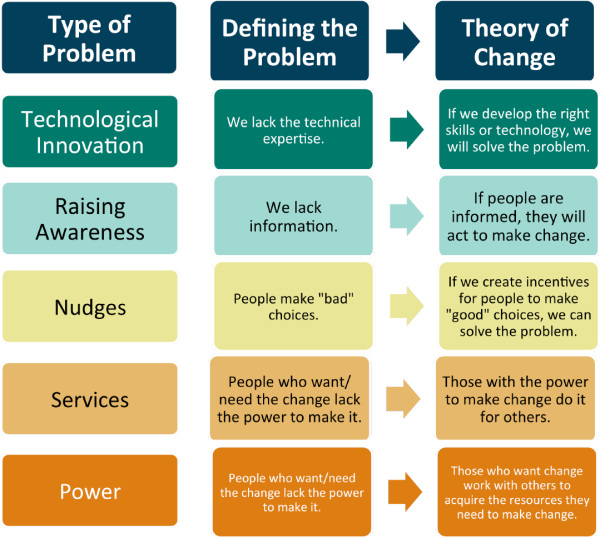 Often, effective solutions require the applications of theories of action that embrace several of Han’s types. Nonetheless, the way forward requires engaging key stakeholders not just in mapping the problem but also in action to solve the problem. Still, as many of us know, engaging others in this work is not always easy. How can we mobilize people to work toward change together? 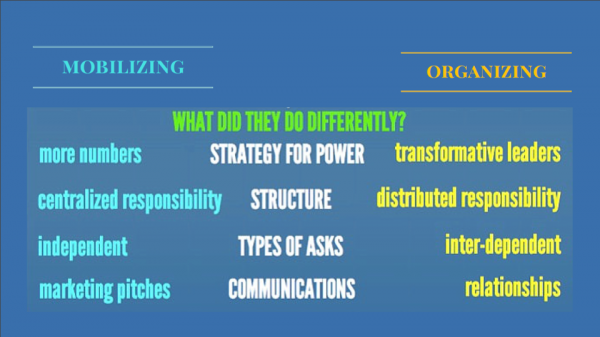 Han’s research offers insights into how to engage people in action to solve problems of power. Often, said Han, when organizations think about getting people to participate in their work, “it’s so tempting to do our work in transactional ways—just trying to hit our numbers, to get the right number of people on the webinar, on our email list, or to come out to our event.” But this kind of mobilization effort is not enough to alter people’s perceptions of what is possible—the mindset shift that is at the heart of true transformational change. Reproduced from Hahrie Han, “Catalyzing Change,” Carnegie Foundation Summit on Improvement in Education, March 24, 2016. Cultivating agency is crucial to ensuring the committed participation that is essential to solve problems of power. But Han stressed that it is a combination of mobilizing efforts and organizing work that leads to the most successful movements. She referenced the Arab Spring as an example of a successful mobilizing effort that did not translate broad participation into meaningful, transformative, and lasting change. On the other hand, said Han, “We’ve seen lots of organizations that do really good work in one community, but they can’t broaden that work.” These groups prioritize the cultivation of a committed cadre of participants at the expense of mobilizing to scale their work. The challenge, explained Han, is to find a balance between mobilizing for breadth of engagement and organizing for depth of engagement. Ultimately, as Han insists, “our power comes not from the money we raise, it comes not from the messages we craft, but it comes from our humanity.” A movement gains traction and engages participants by focusing on this humanity—by addressing problems that people care about, by transforming what people believe is possible, and, in the end, by changing what their perceptions are of their own responsibility and capacity to act on the problem.